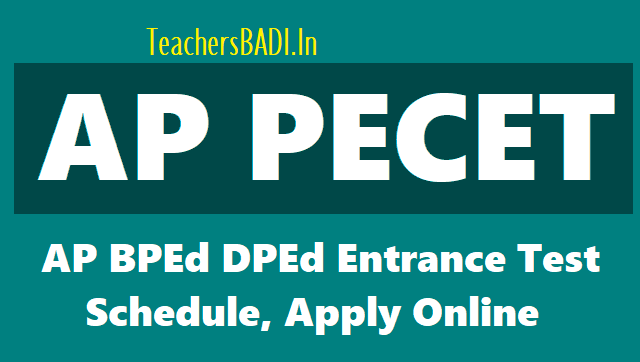 ANU APPECET Physical Education Entrance Test 2019: Online #AP #PECET 2019/AP #BPEd #DPEd Entrance Test 2019: Andhra Pradesh PECET 2019 is a Common Entrance Test as Physical Education Common Entrance Test (PECET-2019) and its schedule would be released in February and the detailed notification would be released on March 16. This test will be conducted by the Convener, PECET 2019, Department of Physical Education, Acharya Nagarjuna University, Guntur for the academic year 2019-2020. Beginning from this academic year, Bachelor of Physical Education will be a two (2) year course. Candidates satisfying the following requirements shall be eligible to appear for Online PECET-2019. 2. Candidates should belong to the both states of Andhra Pradesh. The candidates should satisfy local / non-local status requirements as laid down in the Andhra Pradesh Educational Institutions (Regulation of Admission) order, 1974 as subsequently amended. Candidates should have appeared third year degree final examination or passed three years degree recognized by any university in AP or any other university recognized as equivalent there to and should have completed 19 years of age on 01.07.2019. However, the candidate has to submit the pass certificate at the time of counseling. Candidates should have appeared or passed Intermediate or equivalent course recognized by the Government of Andhra Pradesh State and should have completed 16 years of age on 01.07.2019. However, the candidate has to submit the pass certificate at the time of counseling. The in-service Physical Education Teachers (P.E.Ts) seeking admission into B.P.Ed (One Year) Course or U.G.D.P.Ed. (2 Years) Course need not appear for any Entrance Test conducted by PECET Convener. They have to apply directly to the Director of School Education, Hyderabad through their respective D.E.O.s through proper channel. The Director of School Education will nominate a limited number of candidates to the respective colleges. Note: Graduates obtained the degree under distance mode from Deemed to be Universities and Private Universities are not eligible unless such programs have the approval of joint action committee of UGC and Distance Education Council and AICTE. Eligible candidates, who wish to apply for PECET 2019, may submit their applications through Online mode only. The Registration fee @ Rs. 850/- (for SC, ST candidates Rs.650/-) may be paid at APONLINE centers / meeseva centers / e-seva enters in Andhra Pradesh /through payment gateway (Credit card / Debit card) as per schedule.